While the Tax Cuts and Jobs Act lowered marginal tax rates for individuals, it also reduced or eliminated other preference items, such as certain deductions. One of the items being eliminated is the personal (and dependent) exemption. In the 2017 tax year, the exemption remained available and taxpayers could exempt $4,050 from income for themselves and for each member of their household. This provision was also subject to a phase-out at higher income levels. For a family of five, this represents a total of approximately $20,000 that will be “lost” once the exemption is repealed. However, the new law also significantly expands the child tax credit (CTC). For each $1,000 of income above the income phase-out threshold, the available CTC is reduced by $50. In the case of a family with children, the tax advantage may not be lost under the new law. 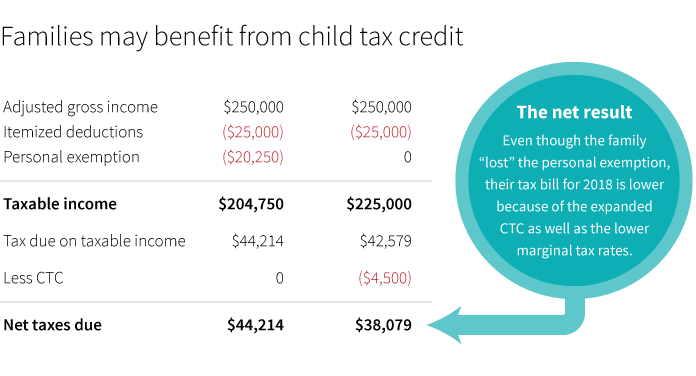 Consider the following example of a family with five (children age 13, 15, and 17) that loses the personal exemption but can now take advantage of the expanded CTC. The net result: Even though the family “lost” the personal exemption, their tax bill for 2018 is lower because of the expanded CTC and the lower marginal tax rates.